Circle, Coven & Grove Giveaway, Anniversary and Announcement! 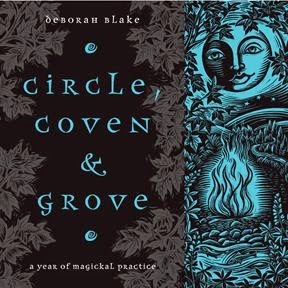 I was on Amazon the other day, checking on something else, and I was astonished to discover that today is the one year anniversary of my rerelease of my first book Circle, Coven & Grove as an eBook. How time flies! As some of you might know, CC&G was my first book with Llewellyn, so of course it holds a special place in my heart. They stopped printing it a couple of years ago (the only one of my books to go out of print) and so I put the book out myself with a fabulous new cover by Mickie Mueller. And here is the original print cover. I want to thank everyone who was so supportive of this little book--you guys really amazed me! Plus I have good news! 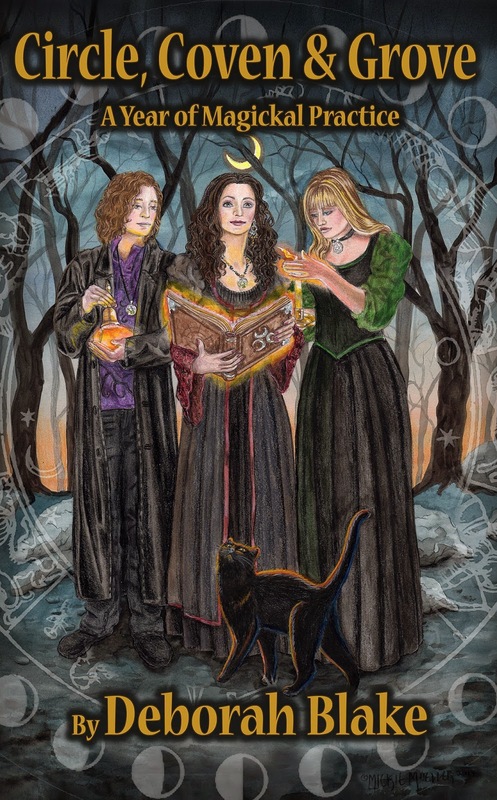 I've been talking to the publisher at Llewellyn (the fabulous Bill, who I got to hang out with at Pantheacon in February) and it looks as though they are going to put Circle, Coven & Grove BACK OUT IN PRINT! Yayayayay! We're still ironing out the last few details, so I can't promise anything and I don't know when it will happen, but it looks pretty likely. So to celebrate the anniversary of the new ebook edition (which will still be available) and the probable rerelease of the book in print, I'm having a fun giveaway for the next couple of days. 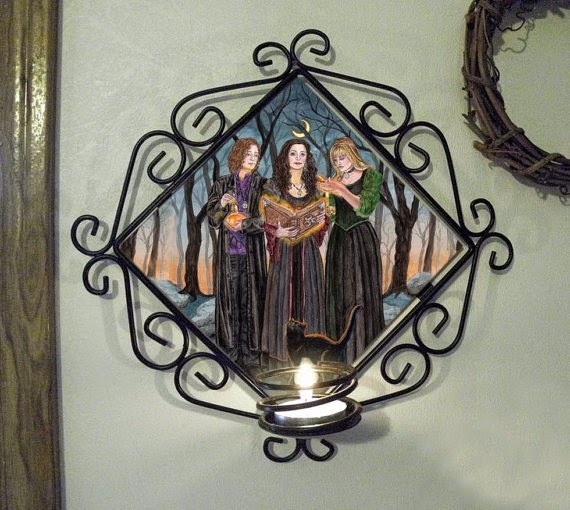 I'll be giving away one of my treasured print copies of the book (signed, of course) and Mickie has very generously included a very cool candle sconce from her Etsy collection. Check it out! And tune in tomorrow, because Elisabeth Alba and I will be posting another report on the Tarot Project! So, do you have a copy of Circle, Coven & Grove? If so, do you have the ebook or the print one? I'm sorry I haven't been around much lately (see previous post for explanation). But I'm going to make it up to you by doing another big giveaway! Do you forgive me now? I thought you would. 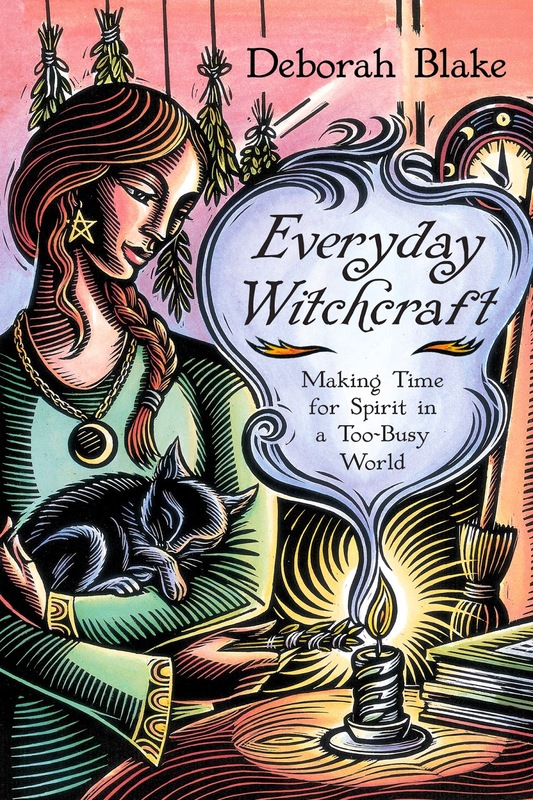 This is a celebration giveaway, because I'm happy to say that it looks like my new Llewellyn Worldwide book, Everyday Witchcraft: Making Time for Spirit in a Too-Busy World is doing quite well, even though it was released almost a month ago. 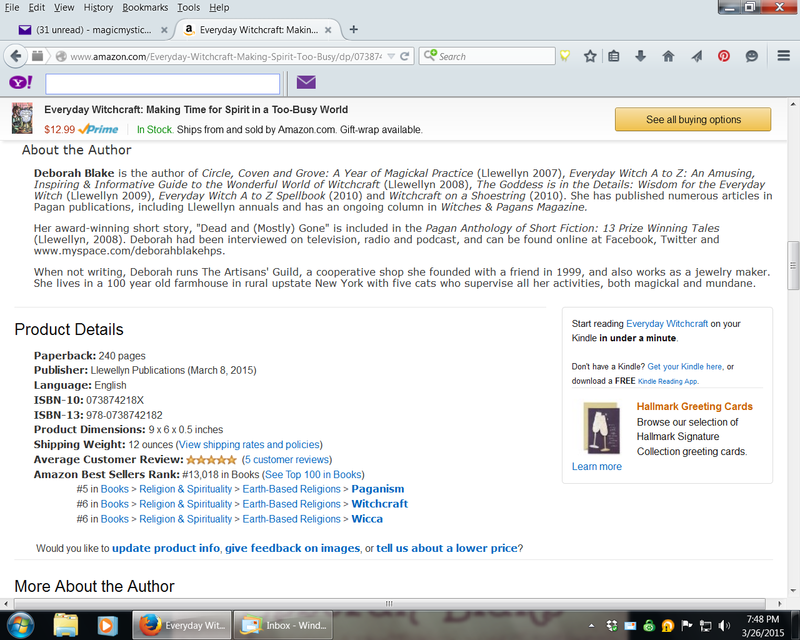 That's right--that says #1 New release! Yes, I know that's not a real word. Never mind. Those numbers are great for a book in its first week of release. For the end of a release month, they're fab. Of course, I only have five reviews so far, and I'd love to get some more (HINT, HINT, SUBTLE HINT), but over all, I'm very happy. I've also had lots of people writing to me and saying how much they love the book, which of course, makes me happier still. So now I'm going to spread the happy by doing a giveaway! I'm going to give away one big prize pack with a double-sided tote bag (just one bag, but it has Everyday Witchcraft on one side and The Witch's Broom on the other), plus a notebook, postcard, and magnet, and a cool broom pen. Sorry, Magic the Cat is not included. She was just supervising. 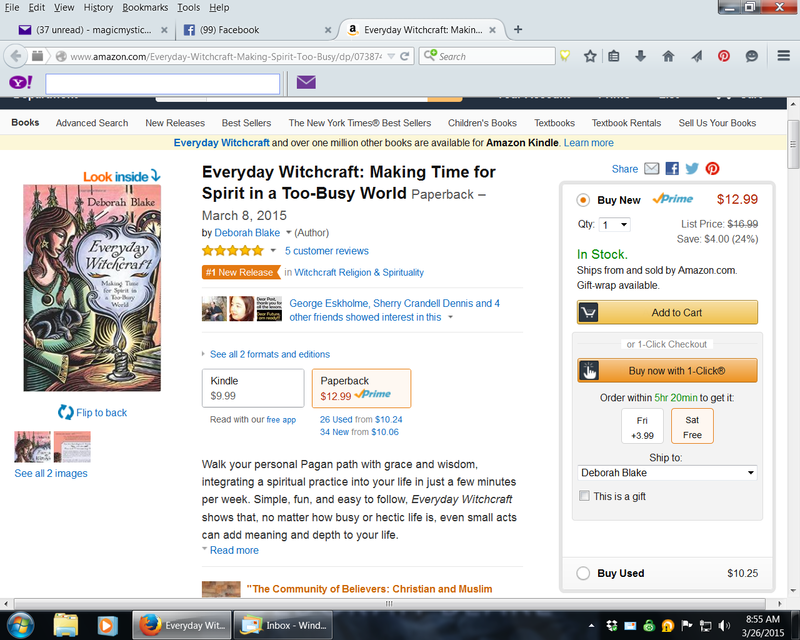 PLUS, I'll be giving away TWO signed copies of Everyday Witchcraft! As usual, it is easy to enter. You get extra points for doing things like buying a copy of the book and posting a review (which this time you can do every day of the contest, as long as you post it in different places each day, like Amazon, Goodreads, and Barnes & Noble ). 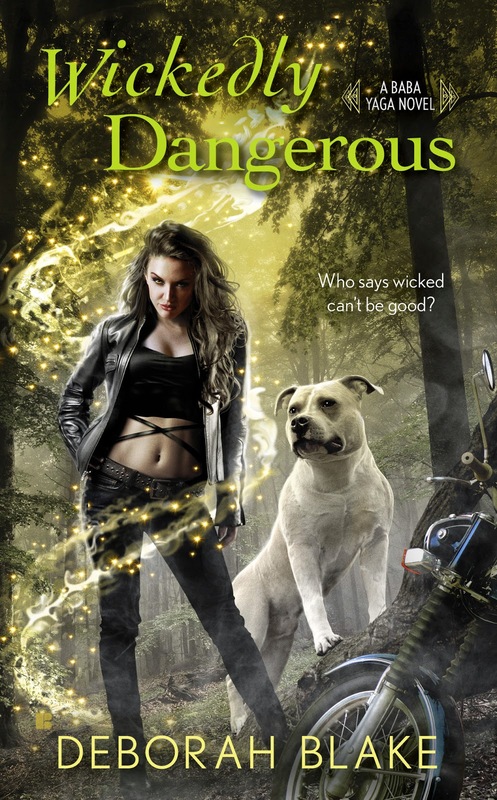 Or you can just comment and tell me if you are excited about the book, love the cover, or just think Magic the Cat is the best prize-putting-together supervisor evah. And of course, I'd love it if you'd spread the word. On account of you are all teh best readers evah. Jo is also a friend of mine and a frequent guest at Blue Moon Circle events, as well as being my best friend Ellen's other best friend. (Basically, we are a strange modern family.) And of course, this has been especially rough for Jenn. Jo is slowly improving every day and we are hoping for the best, although it will be a long road to recovery. But in the meanwhile...I decided I needed to do something to cheer Jenn up. Again, if you follow me on Facebook (and clearly if you don't, you are missing out on all the News), you will know that as I was returning from my visit to San Jose in mid-February, my friend Ellen, who works as a dog groomer at our vets' office, called to tell me about a little cat someone brought in who reminded her of my recently lost Samhain. This little cat, who they think is about six months old and only weighs 4 1/2 lbs, was found in a snowbank, almost dead. She's apparently pretty tough though, since she made a full recovery. They were looking for someone to adopt her. I fought it...I swear I did! But it kept feeling like Samhain had her paw in this, and eventually I caved and said I'd take her. But I had to wait for her to be spayed, and for a second feline leukemia test to come back negative. For the moment I am trying to keep her upstairs with the intention of introducing her to the other cats slowly. But she is affectionate and full of beans and has already made a break for it once, so something tells me that isn't going to work. I'll keep you posted. In the meanwhile, I'd intended to do an overdue giveaway to celebrate the four book deal from Berkley, but it is going to have to be a little more overdue, since I'm pretty much on hospital duty until Jenn goes home on Thursday. (And then I'm going to be madly playing catch-up.) But don't worry, I haven't forgotten about it, and soon enough, there will be another fun batch of goodies up for grabs. Did I mention I also had to replace my furnace unexpectedly? Oh, the joy. Here is a fun picture from the wonderful Christmas Day we all had together in December. So, that's life, really. Some good stuff, some bad stuff, and always, cats. Thanks to all those who sent their good wishes on Facebook--they were all much appreciated. As many of you know, I am hard at work on the next Baba Yaga book (after Wickedly Dangerous and Wickedly Wonderful). I thought you might like a sneak peak at our third Baba Yaga and her (mostly) faithful dragon companion, Chudo-Yudo. The first cover is a pretty good rendition of what I'd envisioned, and the second isn't quite what I had in mind, but not bad. Of course, we are a long way from having a cover for book three, tentatively called "Wickedly Powerful" (they won't even start working on it until the book itself is done), but I thought you'd like a look at how I envision our third Baba, Bella Yates, and her dragon is his disguise. And here is her Chudo-Yudo, who she calls Koshka (which is Russian for a female cat--kind of an inside joke between them, since he is neither a female or a cat, really). Surprise! Yes, we finally have a Chudo-Yudo who is a CAT! (Doesn't he look as though he could actually be a dragon, though?) 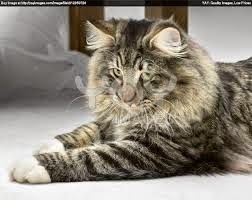 This is a picture of a Norwegian Forest cat--they can grow to be over 30 pounds, although of course Chudo-Yudo is even larger than that. What do you think? Are you happy? Surprised? Excited? I'm really pleased to finally be getting a cat on the cover. I hope you are too!